In Cobia are often not a targeted species, but retained as incidental catch. In the US Atlantic, they are caught by handline, whereas in the Gulf of Mexico, they are caught by a variety of fishing gear including handline, bottom gillnet, and bottom longline. Cobia have life history characteristics that make them resistant against fishing pressure. These include fast growth, quick time to maturity, and high fecundity. A full stock assessment was performed for both the Atlantic and Gulf of Mexico populations in 2013. Neither population is overfished nor experiencing overfishing. Cobia from the US are moderately well managed. Regular stock assessments are performed, and the population is of a healthy status. Bottom gillnets do not target species of concern, although handlines occasionally retain a few species of concern such as yellowfin tuna and grouper. However these species are not considered to be overfished. Bottom gillnets make contact with the seafloor but do not generally cause habitat damage whereas handlines do not touch the seafloor. Cobia is a large pelagic fish found in tropical waters worldwide. However, it has only become popular as a commercially farmed fish in recent years. Cobia aquaculture methods vary from closed recirculating systems in the U.S. to open net pens and ponds in Southeast Asia, Taiwan and Belize. Farmed U.S. cobia is a sustainable choice, while concerns remain over other cobia farms. Cobia inhabit warm waters ranging from 16-32 degrees Celsius and have high growth rates and when grown in farms. They can reach a marketable size in just 9 months. US Cobia aquaculture is regulated at both the state and federal level. Regulations regarding inland farming are quite stringent and US cobia management is considered effective. U.S. cobia is farmed in closed recirculating systems which allow for the constant filtration and removal of solids, effective effluent treatment and low discharge rates. Risk of disease transfer and/or potential escapees are greatly reduced in land-based facilities. U.S. farmed cobia require a lower percentage of fishmeal and oil than many other predatory fish. Cobia are often not a targeted species, but retained as incidental catch. In the US Atlantic, they are caught by handline, whereas in the Gulf of Mexico, they are caught by a variety of fishing gear including handline, bottom gillnet, and bottom longline. Cobia have life history characteristics that make them resistant against fishing pressure. These include fast growth, quick time to maturity, and high fecundity. Neither population is overfished nor experiencing overfishing. Cobia from the US are moderately well managed. Regular stock assessments are performed, and the population is of a healthy status. Bottom longline vessels have some observer coverage. 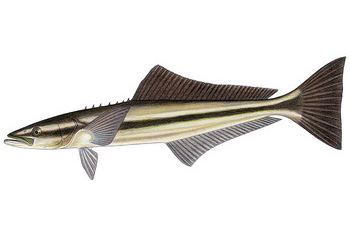 In the Atlantic, the target fishery’s species from which the cobia are retained are not overfished nor experiencing overfishing. However, many species landed in the Gulf of Mexico fishery are depleted. Additionally, the use of bottom longlines in the Gulf of Mexico fishery causes the bycatch of the endangered loggerhead sea turtle. Bottom longlines make contact with the seafloor but do not generally cause habitat damage. Farmed cobia in Panama is produced by one facility called Open Blue Sea Farms. Global production of cobia exceeds 50,000 mt per year, the majority of which is from China. Panama produced 1,500 mt in 2014 mostly for export to the US. Open Blue Sea Farms collaborates with researchers and the University of Miami consistently monitors environmental impacts of the farm. Information on the source of feed is lacking, however scientific data suggests that 3.5 lbs of wild fish are used to produce 1 lb of farmed cobia at Open Blue Sea Farms. This high use of wild fish sources is concerning as it increases pressure on wild fish populations. Escapes from open net pens are an ongoing risk and have occurred in the past. Farmed cobia are slightly genetically different from their wild counterpart but it is not known whether interbreeding would be detrimental to the wild population. There is the possibility for disease and/or parasite transfer to wild individuals. Shark attacks on the net pens have occurred in the past, but the sharks are removed by non-lethal methods. Due to their direct contact with the marine environment, marine net-pens pose an inherent risk to the surrounding habitat and fish populations. However, the net pens are submerged to a depth of 65-70 metres below the surface which minimizes habitat impacts. This is because the deep water environment is low in nutrients and allows for any excess nutrients produced by the farm to be quickly absorbed by phytoplankton and bacteria. Effluent and benthic habitat below the net pens are consistently monitored by the University of Miami. Farmed cobia can acquire diseases or pathogens that require treatment using chemicals. It is thought that antibiotics have been used on the cobia in the past.